Once again, here are the 2015 Sun Belt standings. 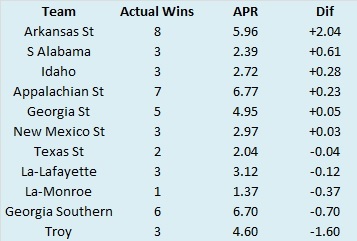 Arkansas State and Troy saw their actual record differ from their APR by more than a game and a half each. These two schools also saw their records differ significantly from their expected records based on YPP. So, instead of rehashing what I said last week, let’s take a sojourn through Sun Belt history. 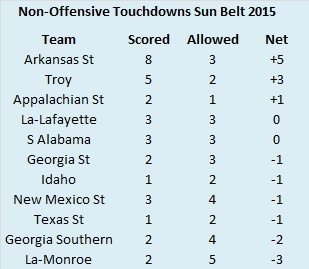 For most of its existence, the Sun Belt has been the weakest of all the FBS conferences. It has been the home of FBS nomads and neophytes. No Sun Belt school has ever been ranked or finished a season ranked (former member Western Kentucky did end the year ranked in 2015). This of course does not mean the Sun Belt lacks entertaining football. I for one, enjoy their midweek games. 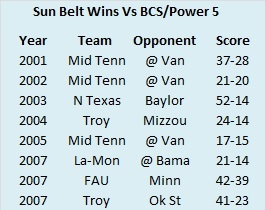 So let’s celebrate the fifteen years the Sun Belt has been an FBS conference by revisiting all their wins against BCS and Power 5 opponents. 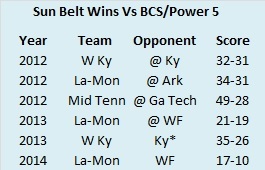 Sun Belt teams have won 20 games against BCS/P5 opponents. Those wins are listed by year in the tables below. Sun Belt teams did not win any games against Power 5 opponents in 2015, but they did win eight in the four-year span from 2011-2014, so hopefully they can get back their winning ways in 2016. Feel free to peruse the table at your leisure, but I have combed through the results and come up with a few Sun Belt superlatives. Enjoy. The Blue Raiders, a former Sun Belt member, have beaten six BCS/P5 teams while playing under the Sun Belt banner. Their best win was probably the beatdown of a Georgia Tech team that would play in the 2012 ACC Championship Game (thanks to a technicality). 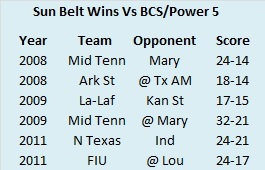 For current members, Louisiana-Monroe has the most wins against BCS/P5 opponents with four. Vanderbilt has three losses to Sun Belt teams with all three coming to Middle Tennessee State. The last loss in 2005 was particularly damaging as it kept a Commodore team with Jay Cutler at the helm home for the holidays. Vanderbilt would rebound and qualify for a bowl game just three seasons later, but at the time it had to feel like a huge missed opportunity for the Commodores in their quest to end their two-decade bowl drought. My, how times have changed. North Texas was in the midst of winning the first four Sun Belt league championships while Baylor was a perennial Big 12 punching bag. Baylor won the return match in Waco the following year, and I think they would be favored if the two were to play in 2016. Overtime: Check. Two-point conversion for the win. Check. A video is worth a thousand words. This concludes our in depth look at all ten FBS conferences. I will be back sporadically throughout the summer with some gambling advice, a Vegas trip recap, and perhaps a few season previews. In the meantime, check my Twitter for witty observations and my Instagram for humorous memes. Thanks for reading. We now turn our attention to the final conference alphabetically. 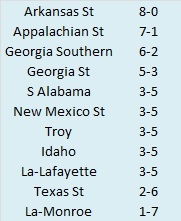 Here are the Sun Belt standings. College football teams play either eight or nine conference games. Consequently, their record in such a small sample may not be indicative of their quality of play. A few fortuitous bounces here or there can be the difference between another ho-hum campaign or a special season. Randomness and other factors outside of our perception play a role in determining the standings. It would be fantastic if college football teams played 100 or even 1000 games. Then we could have a better idea about which teams were really the best. Alas, players would miss too much class time, their bodies would be battered beyond recognition, and I would never leave the couch. As it is, we have to make do with the handful of games teams do play. In those games, we can learn a lot from a team’s Yards per Play (YPP). Since 2005, I have collected YPP data for every conference. I use conference games only because teams play such divergent non-conference schedules and the teams within a conference tend to be of similar quality. By running a regression analysis between a team’s Net YPP (the difference between their Yards per Play and Yards per Play Allowed) and their conference winning percentage, we can see if Net YPP is a decent predictor of a team’s record. Spoiler alert. It is. For the statistically inclined, the correlation coefficient between a team’s Net YPP in conference play and their conference record is around .66. Since Net YPP is a solid predictor of a team’s conference record, we can use it to identify which teams had a significant disparity between their conference record as predicted by Net YPP and their actual conference record. I used a difference of .200 between predicted and actual winning percentage as the threshold for ‘significant’. Why .200? It is a little arbitrary, but .200 corresponds to a difference of 1.6 games over an eight game conference schedule and 1.8 games over a nine game one. Over or under-performing by more than a game and a half in a small sample seems significant to me. In the 2015 season, which teams in the Sun Belt met this threshold? 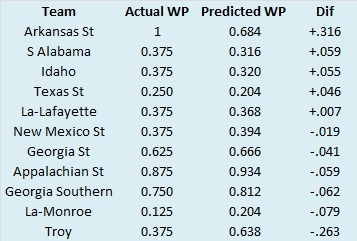 Here are the Sun Belt teams sorted by performance over what would be expected from their Net YPP numbers. 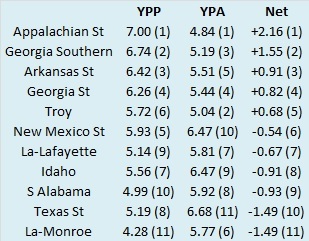 The 2015 Sun Belt season saw a pair of teams with records that diverged significantly from their expected records based on YPP. 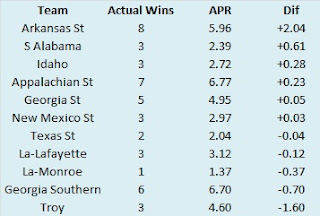 The league champion, Arkansas State, significantly over-performed their expected record, and former league heavyweight, Troy, significantly under-performed under first year coach Neal Brown. Arkansas State was a bit unusual as they went unbeaten in Sun Belt play and won each of their conference games by at least ten points. How were they able to win games so easily despite good, but not great YPP numbers? For starters, they boasted a turnover margin of +17 in their eight Sun Belt games. A few weeks ago, in the Mountain West YPP post, I examined similar teams that averaged turnover margins greater than +2 per game or less than -2 per game. Like San Diego State, Arkansas State is due for some regression in the turnover department and likely in their record as well. In addition to their healthy turnover margin, Arkansas State also managed to score in unconventional ways. 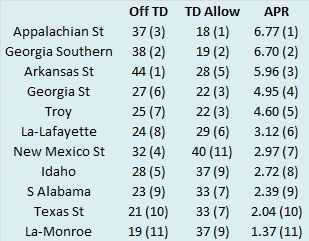 They scored eight non-offensive touchdowns in Sun Belt play (five interception returns, two fumble returns, and one punt return), and their net non-offensive touchdown margin was the highest in the conference by far. As you can see, Troy also had a solid non-offensive touchdown margin, but the Trojans finished 0-3 in one-score league games. Meanwhile, all their wins came in dominating fashion, with each coming by at least 24 points. One of the bigger surprises (at least to me) from the 2015 Sun Belt season was the struggle of Louisiana-Lafayette. After four consecutive bowl appearances (and wins) under head coach Mark Hudspeth (perhaps the strongest FBS coach), the Ragin' Cajuns slipped to a 4-8 record and finished in the bottom half of the conference. Was this a random blip for Lafayette or a sign of things to come? To try and answer this question with something aside from wild speculation, I looked at other coaches who like Mark Hudspeth: began coaching since 1984 (the relative modern era), coached at an FBS mid-major (like Louisiana-Lafayette), had at least four consecutive winning seasons to begin their tenure, and then suffered a losing campaign. Perhaps not surprisingly, with so many stipulations, only six other coaches met the criteria. And one of them is probably familiar to Ragin' Cajun fans. The following table lists the six coaches, the school they coached at, their record in their first few years until their losing year, the year they suffered a losing record, the year they got back to their winning ways (if they ever did), and their career record after their first losing season. I know that's a lot to digest, but take a look at the table, and I'll summarize later. To help you read the table, I'll go through Fisher DeBerry's row. DeBerry coached at Air Force and posted a 35-14 record in his first four years. In his fifth year, the Falcons slipped to 5-7. His charges rebounded immediately, posting a winning record in his sixth season. All told, after going 5-7 in his fifth season, DeBerry managed a 129-88-1 record over the next 18 seasons at Air Force. Of the six coaches who met the criteria, I think we safely say just two could be deemed 'successful' after their first losing campaign, and both happened to coach for the Air Force Academy. Fisher DeBerry rebounded from his first losing season to spend 18 additional years at the school. His successor, Troy Calhoun, has also bounced back from his first losing season. The three seasons since his first losing year have resulted in a rather mediocre 20-19 overall record, but that includes a putrid 2-10 record in 2013. Over the past two seasons, the Falcons are 18-9, with a division championship. The other Lafayette coach, Nelson Stokley (father of Super Bowl hero Brandon Stokley), lasted eight years at Lafayette after his first losing season, but posted just three winning records over that span. The other three coaches, Gary Blackney, Tom Amstutz, and Gary Darnell (all MAC coaches coincidentally), failed to produce any winning seasons after their first losing campaign. Based on an admittedly small sample size, 2016 appears to be a very important year for Mark Hudspeth. DeBerry and Calhoun got back to their winning ways within two years after posting their first losing season. The lesson appears to be that despite past success, mid-major coaches have a very short time frame to pull out of their tailspin. Either the plane crashes or someone else hops in the pilot seat. Once again, here are the 2015 SEC standings. 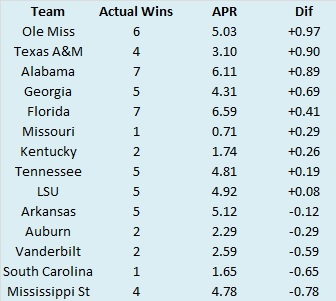 No SEC team significantly over or under-performed their expected APR. Since no team significantly over or under-performed, let's talk about a team that was able to efficiently turn their small per-play advantage into a much larger advantage in terms of scoring touchdowns. The Florida Gators were good, especially on defense in 2015. They featured the best defense in SEC play in terms of yards per play. If one adjusts for the quality of competition in their division, they may only rank as the second or third best defense (full disclosure, I didn't do the math), but they were strong on that side of the ball nonetheless. Offense was another story, as their unadjusted per play average ranked just 12th in the 14-team conference. However, when it came to scoring touchdowns, Florida went from being bad to being average. Their 23 offensive touchdowns in SEC play ranked sixth in the league. The efficiency gains by the offense were not offset by any losses in defensive efficiency. The Gators allowed just 12 touchdowns in SEC play which was tops in the conference. By paying off drives with touchdowns, Florida was able to post an APR more in line with their actual record as opposed to a middling record predicted by YPP (see last week's post). 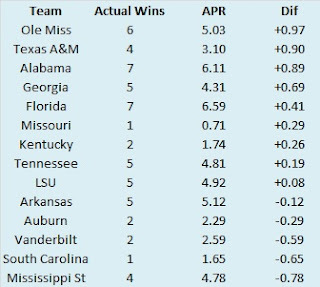 So since their APR was sterling, its clear sailing for the Gators in 2016 right? Maybe not. You may have noticed 2015 was a lot like 2012 for the Gators. From the 7-1 league record, to the disappointing bowl loss, to the narrow win over a Sun Belt school (I know Florida Atlantic is in Conference USA, but humor me), 2015 was eerily similar to 2012 in other ways as well. Here are Florida's vital stats in the conference metrics I track: YPP, APR, and turnover margin with conference rank in parentheses. Over the course of eight conference games three years apart, with mostly different players and a different head coach, the 2012 and 2015 Florida Gators were effectively the same team. In fact, statistically (again unadjusted numbers), the 2012 incarnation was a little bit better. The offensive struggles of both teams were balanced by strong defenses, good to great turnover margins, and an ability to score more touchdowns than one might expect from those weak offenses (be it clutch play, great field position, or what have you). Looking forward though, it pays to heed history when projecting what happens next. The Florida defense remained strong in 2013, posting the best (unadjusted) YPP and allowing the fewest touchdowns. However, the offense remained stagnant (13th in YPP), the turnover margin regressed (to +1), the offense scored six fewer touchdowns in SEC play, and the Gators fell to 3-5 in and missed a bowl. I wouldn't call for a decline of that magnitude in 2016, but a finish of third or even (gasp!) fourth in the SEC East wouldn't shock me. We are closing in on the home stretch. Just two conferences to go. This week we examine the SEC. Here are the 2015 SEC standings. So we know what each team achieved, but how did they perform? 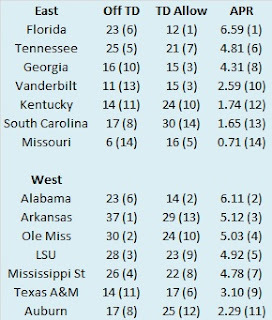 To answer that, here are the Yards Per Play (YPP), Yards Per Play Allowed (YPA) and Net Yards Per Play (Net) numbers for each SEC team. This includes conference play only, with the championship game not included. The teams are sorted by division by Net YPP with conference rank in parentheses. College football teams play either eight or nine conference games. Consequently, their record in such a small sample may not be indicative of their quality of play. A few fortuitous bounces here or there can be the difference between another ho-hum campaign or a special season. Randomness and other factors outside of our perception play a role in determining the standings. It would be fantastic if college football teams played 100 or even 1000 games. Then we could have a better idea about which teams were really the best. Alas, players would miss too much class time, their bodies would be battered beyond recognition, and I would never leave the couch. As it is, we have to make do with the handful of games teams do play. In those games, we can learn a lot from a team’s Yards per Play (YPP). Since 2005, I have collected YPP data for every conference. I use conference games only because teams play such divergent non-conference schedules and the teams within a conference tend to be of similar quality. By running a regression analysis between a team’s Net YPP (the difference between their Yards per Play and Yards per Play Allowed) and their conference winning percentage, we can see if Net YPP is a decent predictor of a team’s record. Spoiler alert. It is. For the statistically inclined, the correlation coefficient between a team’s Net YPP in conference play and their conference record is around .66. Since Net YPP is a solid predictor of a team’s conference record, we can use it to identify which teams had a significant disparity between their conference record as predicted by Net YPP and their actual conference record. I used a difference of .200 between predicted and actual winning percentage as the threshold for ‘significant’. Why .200? It is a little arbitrary, but .200 corresponds to a difference of 1.6 games over an eight game conference schedule and 1.8 games over a nine game one. Over or underperforming by more than a game and a half in a small sample seems significant to me. In the 2015 season, which teams in the SEC met this threshold? 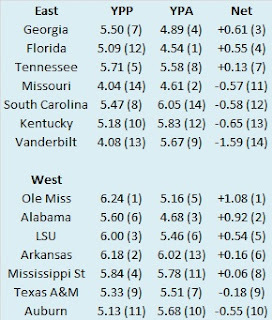 Here are the SEC teams sorted by performance over what would be expected from their Net YPP numbers. 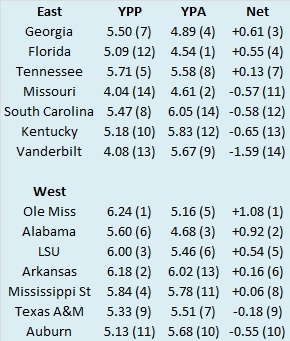 The SEC saw a pair of teams fall below and a pair of teams exceed their YPP expectations. For Missouri and South Carolina, the two teams that failed to reach their expected record based on YPP, the culprit was simple: close game results. Missouri and South Carolina finished a combined 0-6 in one-score conference games. While both teams were especially bad on one side of the ball (offense for Missouri and defense for South Carolina), it took several bad bounces for them to finish a combined 2-14 in SEC play. 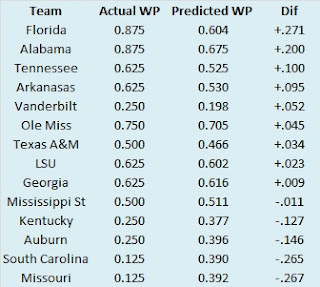 The two teams that vastly exceeded their YPP results also happened to meet in the SEC Championship Game. A confluence of factors allowed the Gators to win the SEC East in their first season under Jim McElwain. Florida finished 3-1 in one-score conference games, boasted the best in-conference turnover margin (+8), and scored three non-offensive touchdowns. For Alabama, the results are more mystifying. The Crimson Tide lost only once all season (by six points), and won just a single conference game by fewer than thirteen points. The Tide were not especially buoyed by turnover margin either, finishing a respectable, but hardly superb +1 in SEC play. However, the Tide did take advantage of unconventional touchdowns. They returned four interceptions for touchdowns in SEC play, including three against Texas A&M. The Tide continued to score in unconventional ways in the playoffs, returning a punt for a touchdown against Michigan State (not needed for the victory) and a kickoff for a touchdown against Clemson (vital to the win). 2015 closed the book on the Steve Spurrier era at South Carolina. As a Columbia resident and degree holder from the university (I try to keep this a secret), I decided to conduct a review of Mr. Spurrier’s overall body of work in the SEC. We’ll start with some basic housekeeping. While Spurrier retired/resigned/quit halfway through the season, we are going to credit the win over Vanderbilt and the three other conference losses under Shawn Elliott to his account. This was his team after all, even if he couldn’t stand to see them play defense either. 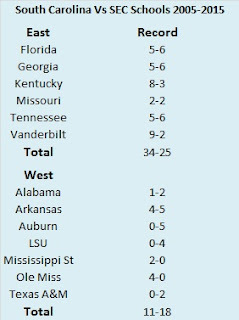 Let’s start by looking at his SEC record. 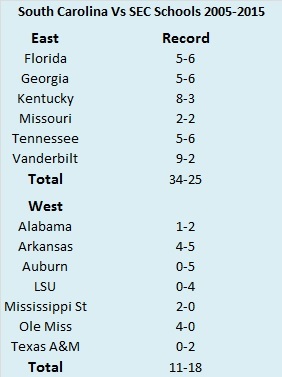 The following table lists the conference record for each SEC team since the 2005 season. Newcomers Missouri and Texas A&M are listed at the bottom. 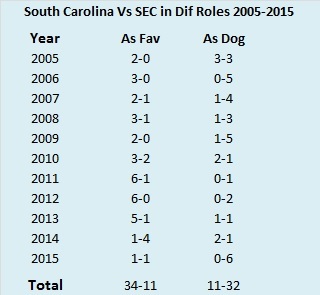 Among the twelve tribes of the SEC, South Carolina ranks almost exactly in the middle over the last eleven years. They also rank third in the East, significantly behind Florida and Georgia, but also significantly ahead of once (and perhaps future) power Tennessee. One interesting, non-Gamecock related observation: Kentucky should be very ashamed. Their league record is worse than Vanderbilt’s over the past eleven seasons! Let’s break that record down a little further. How have the Gamecocks performed against every SEC team? The following table lists South Carolina’s record against every SEC team since 2005. The table is sorted alphabetically with SEC East teams appearing first. A few observations. Based on historical precedent, the Gamecocks performed well against the ‘Big 3’ in the East, compiling a 15-18 record with identical 5-6 marks against each team. That being said, it is easy to see where Spurrier padded has record. The Gamecocks went a combined 17-5 against Kentucky and Vanderbilt, collecting more than a third of his SEC victories (and exactly half of his wins versus the East) against that pair. Finally, outside of a perfect record against the Mississippi schools, the Gamecocks had a horrible track record against SEC West schools. Take away the wins against Ole Miss and Mississippi State, and the Gamecocks are just 5-18 against the West. Finally, how did Spurrier performe as a favorite and as an underdog? 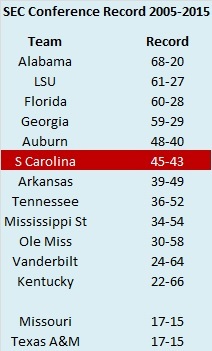 The following table lists Spurrier’s record against conference foes in both roles. These results are straight up, and not against the spread. While this is not a perfect measure (I made no distinction between being a twenty point favorite and a two point favorite), it can give you an idea of how South Carolina was perceived by the tools bookmakers use to set the point spread and by the public once those spreads are made. For example, in his first season (2005), the Gamecocks were only favored in a pair of conference games. Contrast that with 2011 when the Gamecocks were favored in every league game save one. Overall, especially prior to the wheels sort of coming off at the end of his tenure, Spurrier has very good as a favorite (32-6 through 2013). By the same token, he was pretty bad as an underdog, especially in his final season. I’ll leave you with this bit of statistical minutia: If Spurrier had won every SEC game in which the Gamecocks were favored and lost each one in which they were an underdog, he would have ended up with the same record he actually achieved: 45-43. Eerie.